Liquid cooled engines and rotating equipment use glycol based coolants because of their excellent heat transfer abilities. However, glycol based coolants are not desirable at all in lubrication oil itself – Coolant ingression to the lubricant is a particularly nasty contaminant for the variety of damage it can cause. Glycol coolants break down in the high temperature engine environment, leading to formation of glycolic acids. These acids attack nonferrous bearing surfaces and form metal salts. The acids also react with the oil anti wear and anti oxidant additives and, along with water, create sludges that plug filters and cause the oil to lose its lubricity properties, thus increasing abrasive wear. 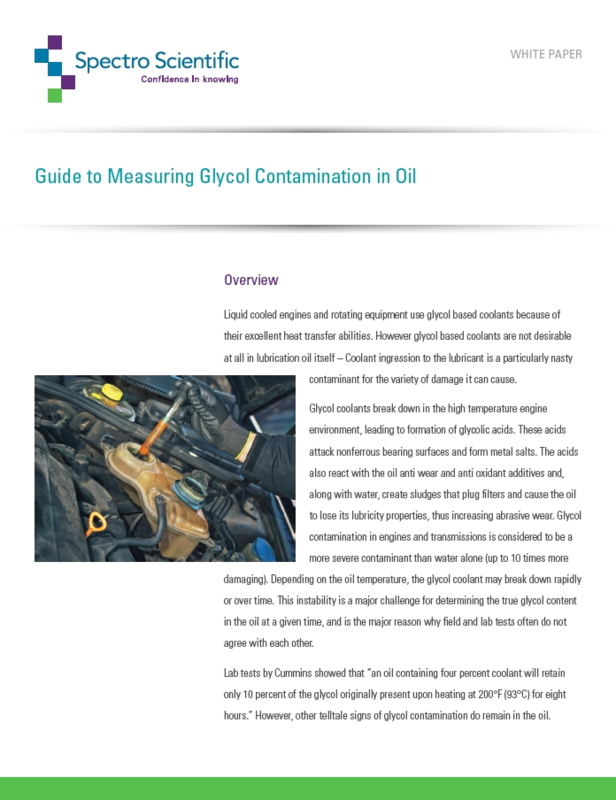 Glycol contamination in engines and transmissions is considered to be a more severe contaminant than water alone (up to 10 times more damaging). Depending on the oil temperature, the glycol coolant may break down rapidly, or over time. This instability is a major challenge for determining the true glycol content in the oil at a given time, and is the major reason why field and lab tests often do not agree with each other. Learn how a gold mine saved more than $1 million in repair costs and lost operating time using an on-site Industrial Tribology Lab (ITL) for predictive maintenance. The days of needing a laboratory full of specialized equipment to do oil analysis are long gone. The MicoLab® all-in-one oil analyzer combines four separate analytical instruments into one compact device. 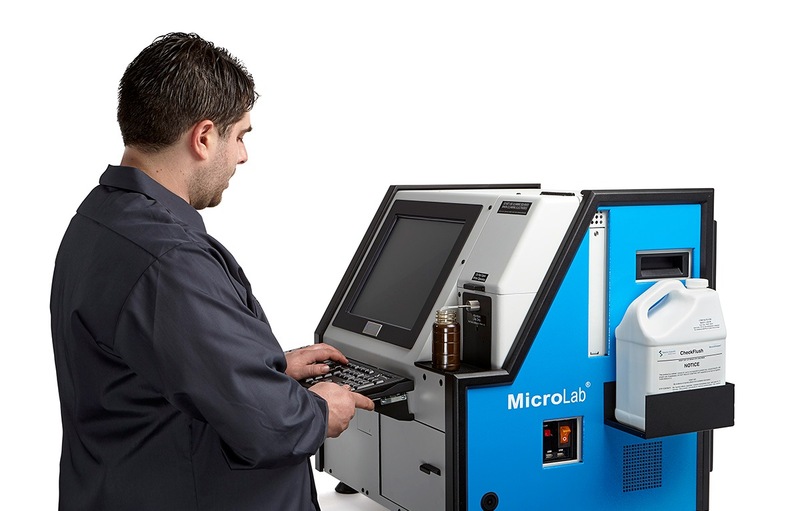 The MicroLab is used to test for elemental analysis, viscosity, oil chemistry and particle contamination. It only requires a small amount of space and is designed to be operated in non-lab environments, like garages, so it is easy to incorporate into your existing work space. Maintaining a fleet of vehicles can be very costly, particularly if that fleet works under difficult conditions, such as a fleet of mining vehicles or a fleet of municipal buses and trucks. Fleet managers are on the lookout for any cost savings they can find. 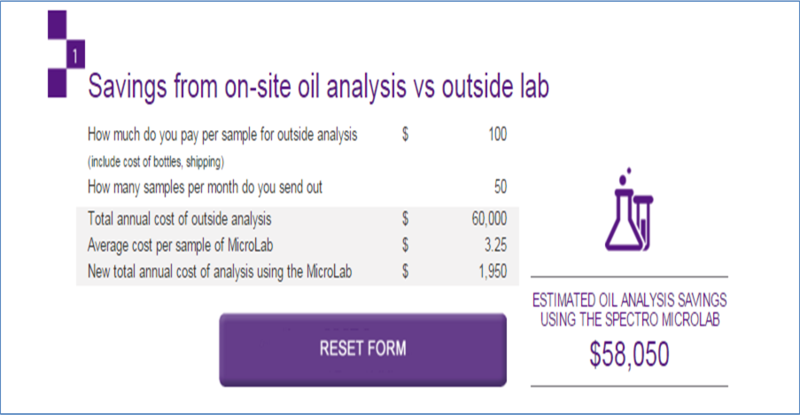 Oil analysis is one area that can offer significant savings and greatly improve workflow in the garage. We've created a savings calculator to estimate how much money a fleet could save by doing oil analysis in house.